For those of you not lucky enough to live in Beavercreek, Ohio, you may not be familiar with our bus stop controversy. Basically, the Regional Transit Authority (RTA), which predominantly serves Dayton and the larger Montgomery County area, wants to construct several bus stops that would be located in our northern business district. Among other things, this district includes a large mall and a new hospital. Although Beavercreek, a Greene County city, currently has no bus stops, it does have a bus stop ordinance. When the RTA initially petitioned Beavercreek a few years ago, city staff determined the request met the city’s ordinance requirements. However, most council members and city residents were opposed to bus stops for reasons such as traffic congestion, associated maintenance and operational costs, security concerns, and city aesthetics. The general consensus was that if we wanted bus stops, some would have already been built. Therefore, in spite of the staff review, city council rejected RTA’s petition in March 2011. During its deliberations, council also added several criteria citing a need to ensure public safety and to prevent the city from incurring any associated costs. The additional criteria included video surveillance cameras, police call boxes, billing RTA for police services, and requiring a $150,000 deposit from RTA in case new traffic signals were needed because of the stops. After council’s vote, and the addition of the new criteria, everybody hoped that RTA would just drop the matter. However, RTA balked at these changes, arguing that the city must follow the original construction codes. At this point, without knowing anything else, it would appear that the conflict could be settled through routine legal procedures and under existing local or state laws. If only things were that simple in the United States of Make-Everything-A-Federal-Case. As mentioned above, RTA serves Dayton, Ohio, where many riders happen to be Black. Beavercreek is predominantly White, so in today’s charged environment, a number of individuals and groups automatically assumed racism must be at the core of Beavercreek’s resistance. 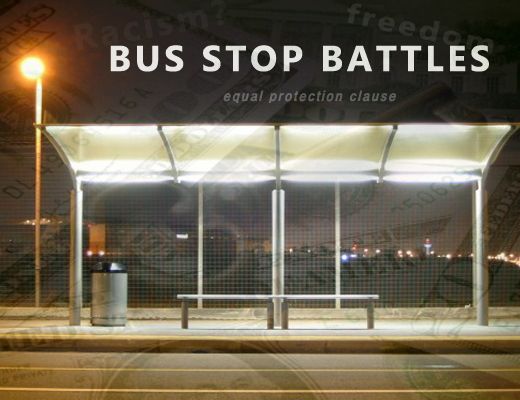 So faster than you could say “equal protection clause,” a local bus stop dispute turned into a federal civil rights case. In August 2011, Leaders for Equality and Action in Dayton (LEAD) became the de facto public voice for the bus stops. LEAD petitioned the Federal Highway Administration (FHA), and after a number of hearings, heated city hall meetings, and lawyer bloviations, the FHA made its decision in 2013. Although the FHA did not rule on Beavercreek’s reason for denying the bus stops, the FHA’s civil rights division found that Beavercreek was in violation of the Civil Rights Act of 1964 by denying minorities transportation access to jobs, education, and medical treatment available in the mall area. Then came the hammer. If the city would not allow the bus stops, it would be in danger of losing federal highway funds—approximately $11M over a five year period. On October 14, 2013, Beavercreek City council voted to approve RTA’s original request by a vote of 5-2. There is a bigger story here than disputes over a few bus stops, and the story has a plot as old as the republic. What is the role of the federal government in local disputes? If you accept its role in civil rights matters, then is it possible for the federal government to abuse that power? Is it possible that common sense is the first casualty in the blind bureaucratic application of the law? There is also a subplot to our story. Who gave the federal government the tools needed to enforce bad decisions? Maybe it was the Sixteenth Amendment, which gave rise to the modern income tax, under which behavior is controlled through tax legislation. Maybe it started with the Seventeenth Amendment, after which senators no longer represented states but just became popularly elected glorified representatives. Maybe it has been the recurring liberal interpretation of the Commerce Clause that basically allows nearly all human activities to be subject to federal interstate oversight and jurisdiction. Regardless of the causes, if there has been a pattern over the past 100 years, it has been the continual erosion of state and local authority by the federal government. This process has strong political support because the federal government taxing cities and states, then offering money back for whatever purpose is the essence of pork. Many elected officials are absolutely giddy when they announce to their constituency receipt of federal money. But it seems many of these same officials are ignorant, confused, or inconsistent when it comes to understanding the strings attached to the money. A Beavercreek school board member who has been on the board for a number of years and in the past has happily accepted federal education money complained about the feds threatening to withhold highway money in the bus stop case. That’s strange talk for someone who tells taxpayers, complaining about education policy, that the board’s hands are tied because they accepted federal money. Even Governor Kasich, a self-proclaimed conservative, is aggressively seeking Medicaid funds under Obamacare. Someone should tell him about the small print in the agreement. Beavercreek has never stopped anyone from coming into the city for business, recreation, or to call it home. Sometimes a bus stop is just a bus stop, and sometimes a city just doesn’t want them. But the city has accepted federal money. In the old Twilight Zone TV series, one recurring storyline depicted someone who agrees to accept help from a mysterious gentleman who appears just when help is desperately needed. The only condition is that the desperate individual signs a contract which, in the zeal of the moment, he or she never bothers to read or understand. By the end of the episode, when things don’t work out as hoped for, the stranger reappears demanding payment in money or the person’s soul. Don’t bother with money; it’s the latter that is preferred. Related on OCR: All articles by Tony Corvo.